If you thought the six-inch Lumia 1520 was a monster phone, then hold onto your hats: Windows 10 supports phones with up to 8 inches of screen space. In fact, Windows 10 phones could be even larger than the smallest Windows 10 “desktop” PCs. At the Windows Hardware Engineering (WinHEC) conference in China this week, Microsoft is outlining the minimum hardware requirements for Windows 10 phones and desktop PCs. And while some are doubtless hypothetical—could a three-inch Windows 10 phone, or watch, even be practical?—they do suggest some intriguing possibilities. The bottom line is this: Windows 10 phones will scale from 3 inches to 7.99 inches in terms of display size, while Windows 10 Professional “desktop” PCs, or tablets, must have displays of just 7 inches and above. 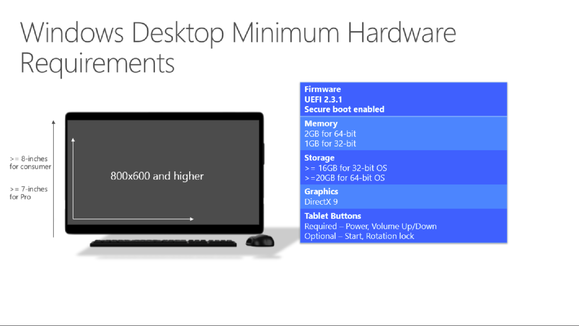 Windows 10 consumer tablets and PCs, meanwhile, must have 8-inch display sizes and larger. Note that Microsoft differentiates between “consumer” and “Pro” versions of Windows 10—the first time we’ve really seen Microsoft confirm this in print. 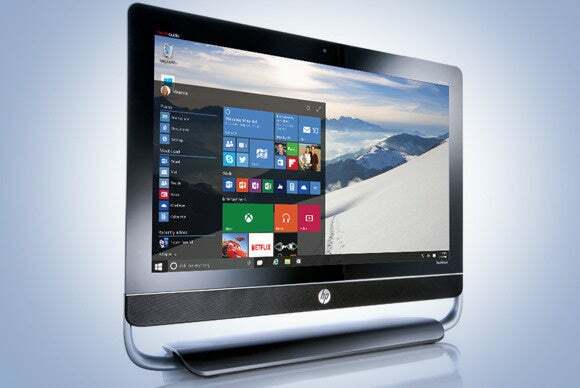 Later, the company also confirms that both 32-bit and 64-bit versions of Windows 10 will ship. Why this matters: We understand that the display sizes of Windows 10 phones and PCs that Microsoft specified are more what Microsoft’s partners could do, rather than what they will. And mammoth phones aren't exactly foreign to Windows Phone (see: Lumia 1520) or Android (Galaxy Mega). Still, I think as a customer I might be a bit puzzled to see a eight-inch Windows phone alongside an eight-inch Windows PC tablet on a store shelf, especially if Microsoft pushes the simplified Windows 10 branding. As for the different versions of Windows 10, it seems like we’ll be hearing more details on this at the Microsoft Build conference in about a month. Not surprisingly, Microsoft is eyeing the future of its phone and desktop platforms with some fairly aggressive specs. At the high end, Microsoft defines a flagship phone with a display of 2,560x2,048 and at least 4GB of RAM. 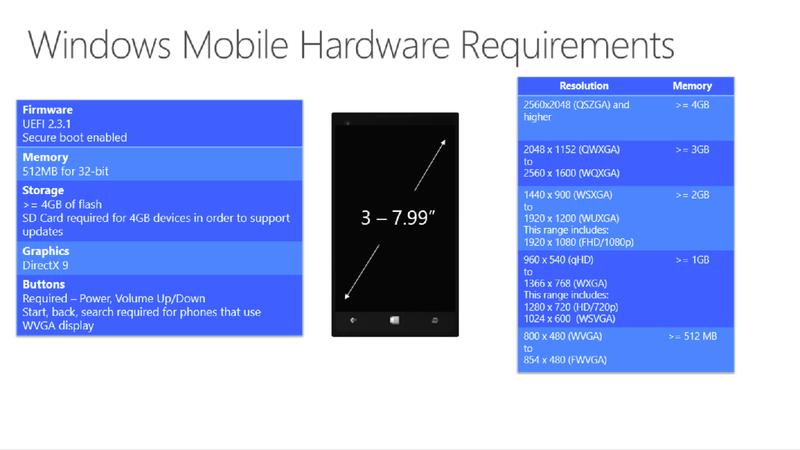 Windows 10 phones will support a minimum spec of 800x480 to 854x480, each with 512MB of memory inside. There will also be phones that fall between the two limits, of course. Windows 10 phones and tablets running on the Windows 10 “Mobile” OS must also have a cellular radio supporting data and voice, plus some of the normal features of a phone: a loudspeaker and earpiece, headphone jack, vibration, power and volume buttons. Hardware buttons will be required on those 800x480 phones, Microsoft added. “Optional” features include touch, 802.11b/g Wi-Fi, and sensors like an accelerometer and gyroscope—which we’d hope would be included in the phone, regardless. Windows phones must also have a minimum of 4GB of flash memory. And if they do have 4GB, they must have an SD card slot so the phone can be updated. Naturally, the minimum storage requirements for Windows 10 PCs are greater: 16GB for a 32-bit version of Windows 10, and 20GB for the 64-bit version. Tablets and PCs must contain 1GB of memory for 32-bit versions, and 2GB for 64-bit versions, Microsoft said. DirectX 9 graphics or higher must be supported. All of the additional requirements for phones—earphone jacks, wireless, sensors and so on—are optional, probably reflecting the legacy desktop PC, where those may not be used. Both Windows phones and PCs will ship with UEFI 2.3.1, the firmware interface that replaces a typical BIOS. Both phones and PCs will include the Trusted Platform Module (TPM) for security’s sake. Microsoft said it will offer a Windows Hardware Compatibility program, ensuring that a given PC will work with others running Windows 10, but that it won’t be mandatory to ship a device. Products that pass Microsoft’s testing, however, will be noted on its site.